This review by Julie Jensen originally appeared in the January/February 2019 issue of Northern Gardener. As you plod through the gardening off-season, you may wish for the chance to hear from a variety of gardening pros on ways to develop your horticultural repertoire. Taking a class is one option (and a good one). 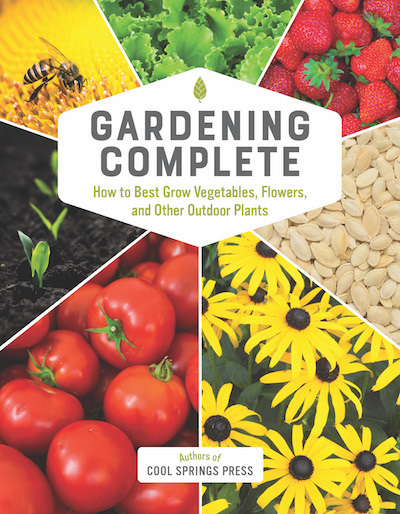 Another is to crack open Gardening Complete, How to Best Grow Vegetables, Flowers, and Other Outdoor Plants. Cool Springs Press has pulled together a lineup of its crack garden writers, including Lynn Steiner and Rhonda Fleming Hayes of Northern Gardener fame, for a garden seminar in print. Plus, the photos are gorgeous and generously displayed, enhancing the book’s appeal on gray winter days. If it grows outdoors, they cover it. The basics of botany, geology (well, soil, at least) and entomology ground you in the science of what happens in your garden while the fundamentals of design give you tools to make things beautiful. All the “ings”—planting, watering, fertilizing, pruning, composting, mulching, propagating and harvesting—get addressed thoroughly. It’s no surprise that the tone throughout Gardening Complete, though in the authors’ distinctive voices, supports non-chemical, environmentally sustainable strategies. Chapters on pollinators (Hayes), xeriscaping (Steiner), weeds, pests and diseases offer multiple, carefully explained techniques for getting what you want in your garden without wreaking havoc on the rest of us. And, while the beginning gardener can find the right information to take that first step into the planting world in, perhaps, a container on the deck, seasoned growers will also learn ways to improve and expand their gardens.